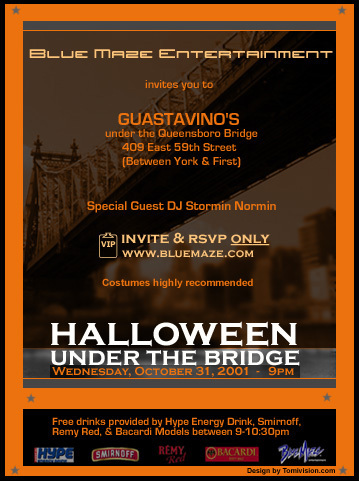 Blue Maze Entertainment recently teamed up with Joonbug Productions to throw the hottest Halloween party in NYC. The event was held October 31st and was co-sponsored by Bacardi USA, Smirnoff, Hype Energy Drink, & Remy Red. Free drinks were provided by Bacardi Models. Special Guest DJ Stormin Norman (VIP room of Float, Lot 61, Suite 16, Bungalow 8, Tiki Room, and Rubber Monkey) spun hip hop and dance music all nite. Special appearances were made by cast members of FOX's Love Cruise and Temptation Island 2.. and of course, the BlueMaze.com Webmistress.